The marketplace showed no mercy during ATVI's recent decline. Activision Blizzard Inc. (ATVI) is slated to release its earnings after Tuesday's market close. I hope investors are impressed with the fundamental numbers as the charts and indicators are not in a bullish alignment ahead of the report. Let's check out the charts this morning to see if there are any key points we should be aware of for Activision Blizzard, which is the Stock of the Day here at Real Money. In this daily bar chart of ATVI, below, we can see that the price of ATVI has been cut in half in about four months. The marketplace showed no mercy during the decline. Prices broke below the flat 50-day moving average line and the cresting 200-day line in October. The selloff got going and bounces were relatively feeble. Bounces in January failed at the underside of the still-declining 50-day line. The daily On-Balance-Volume (OBV) line has been in decline from early October and just made a new low to confirm the downtrend and tell us that sellers of ATVI have been more aggressive. In the lower panel is the 12-day price momentum study, which shows that price momentum has slowed from November. However, this bullish divergence has not translated into a rally. In this weekly bar chart of ATVI, below, we can see that prices broke a major uptrend. ATVI is well below the declining 40-week moving average line. Every support level from 2018 and 2017 has been broken. That's not good. The weekly OBV line has been very weak since July and suggests a lot of distribution (selling or liquidation). The 12-week price momentum study in the lower panel shows that the decline has slowed, but that is not the same as a bullish divergence. 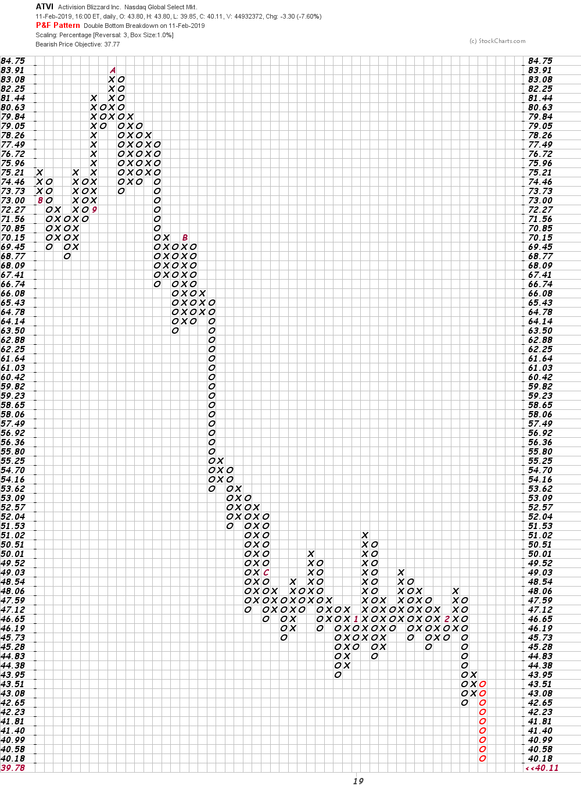 In this Point and Figure chart of ATVI, below, we can see the long decline and a further downside price target in the $38-$37 area. If prices bounce the $44-$50 area is likely to act as resistance. Bottom line strategy: Ralph Acampora, CMT, was my first teacher of technical analysis way back in 1974. I remember him saying in class that "if you throw garbage down hard enough it will bounce." (The 1973-1974 bear market was brutal.) The charts of ATVI are bearish and do not support a rally, but a bounce is possible because they have been trashed so hard.